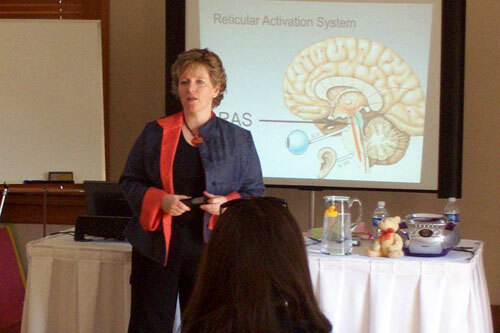 Annie Hopper teaches her Dynamic Neural Retraining System™ to workshop participants in Canada. JG/JL: Hello Annie, thank you for taking the time to discuss your exciting new protocol with us. Please share with us how you initially became severely chemical and electrically sensitive. AH: The main exposure that I had was over a five month period. I believe it was due to unhealthy air quality in an old building where I rented office space for my busy counseling practice. I gradually started to become sensitive to chemicals. Within six months the sensitivity had spread from perfumes and colognes to all chemicals. JG/JL: What level of MCS were you at prior to beginning your work with neuroplasticity? Our impression is that you were severely affected. AH: Laundry detergent residue, fabric softener residue and fabric softener dryer fumes were horrific for me and I would at times have “seizure like” reactions to exposures. I became severely chemically sensitive in April 2006. Chronic insomnia and fibromyalgia had set in by this time as well. To go anywhere outside of my home took Herculean efforts and courage – I had to wear a carbon filtered mask to go anywhere. I felt like a freak. By the following year around the same time, I had also become electrically sensitive. JG/JL: We understand that, at one point, you were homeless. Tell us a bit about that time and how you survived. AH: When I became electrically sensitive in addition to being severely chemically sensitive, I could no longer live in my own home. I camped for a short time and then ended up living on a broken down houseboat for four months. It was a step up from camping and I was grateful to have a roof and my own space. I survived in large part with lots of faith and love from my partner and family although they lived thousands of miles away. I lived alone on the houseboat with my dog Bella and my partner James would take a week off from work approximately every five weeks to come and see me. Food sensitivities were not an issue for me so I could pretty much eat anything and would shop at a local grocery store for food. Although shopping was difficult, I could force myself to do it. JG/JL: You’ve been through a lot. What are some of the things you had to give up in life during that time? AH: I gave up my home, the comfort of living with my partner, my job, my friends, my identity, and my faith. rather than what I was losing. JG/JL: Losses we are both familiar with, as are most who develop this illness. How did you deal with all the stress from your physical symptoms, psychological separation from society, and loss of friends, work, family, and home? AH: Anyone with severe MCS knows how difficult it is to survive this illness. At times I felt very hopeless and overwhelmed with the enormity of the illness and how it affected every area of my life. I grieved for the loss of my health, my friendships, the physical separation from my partner, my family, my job and the many friendships that I had lost along the way. I found comfort in long walks along the ocean shoreline with my dog Bella. I wrote about what I was feeling and what I was learning about myself and life throughout this time. I’m now in the process of publishing a book about my journey entitled “From Exile to Excellence: Healing Multiple Chemical Sensitivities Through Neuroplasticity“. It will include actual journal entries from my time while living on the houseboat. I also prayed a lot, and I spent as much time as I could in places where my body felt okay. I tried to focus on what I was learning rather than what I was losing. JG/JL: You have recommended Norman Doidge’s book The Brain That Changes Itself on your website. This book offers an inspiring collection of recovery stories all based on the concept of brain plasticity – the ability of the brain to rewire itself. As you know, neural pathways of the adult brain were previously thought to be fixed and hardwired by a certain age but recent scientific discoveries have proven the brain to be highly adaptive and flexible throughout one’s lifetime. Parts of the brain thought to be limited to specific functions are actually capable of taking over other unrelated functions. Through these discoveries, scientists have been able to use focused exercises to develop new neuronal pathways that help people recover from strokes and even some rare conditions such as phantom limb pain, or complete loss of balance. It was this fascinating book that jumpstarted your approach to healing your own MCS – how did you find your way to this book? AH: A friend of mine suffering from depression recommended it. JG/JL: Was there a defining moment that led you to your current understanding of what chemical sensitivity is and how principles pertaining to Traumatic Brain Injury (TBI) recovery seemed like a hopeful application for the problem—do you view MCS as a stroke-like or brain trauma condition? AH: I view MCS as an acquired toxic brain injury that impairs limbic system function, affecting areas of the brain such as the hypothalamus, amygdala, hippocampus, and cingulate cortex. Although the initial injury may heal, the brain gets stuck in a repetitive trauma pattern. 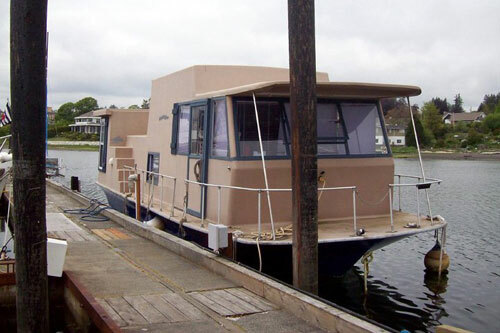 Run-down houseboat that Annie lived on for four months. JG/JL: Did you have help rewiring your brain or did you figure this out through your own personal research? AH: I did have some help in this department for sure. The Dynamic Neural Retraining System was developed from a combination of what I had learned over the past 20 years while employed in the health and wellness industry, as well as from all of the information, treatments, therapies and research I experienced and studied during my MCS days. JG/JL: Did you ever contact any of the neuroscientists mentioned in Doidge’s book or the other sources of research you found along the way? AH: I’ve got some feelers out there but no bites yet. However, I am very hopeful that I will have the research that I need in due time. I recently trained a woman who is initially from Japan who has great contacts with doctors there who are interested in neuroplasticity as it relates to chemical sensitivity. Apparently MCS is so common in Japan that they have government-funded clinics that treat people with MCS. So, not only is it recognized as a legitimate illness there, but the government also pays for detoxification and nutritional supplements for patients. However, they do not know how neuroplasticity ties in to all of it so I am very hopeful I will be going to Japan soon to teach the head environmental doctors there what I know. My hope is that they will have the funding available to do some functional MRI testing on people with MCS and be able to measure the effects of the Dynamic Neural Retraining System. My vision is that this research will validate several facts: 1) That the symptoms of MCS are caused from impaired limbic system function; 2) That through manually rewiring the brain we can repair limbic system function and alleviate symptoms of illness; 3) That we will have all the evidence we need in terms of chemical and EMF hazards to force the government to regulate these industries. JG/JL: That would certainly be wonderful. How is the limbic system involved in your retraining work exactly? AH: Through manually changing brain pathways we can decrease the brain’s “fight or flight” response that is regulated by the limbic system. In essence, we reprogram our limbic system. The first step of my Dynamic Neural Retraining System is to use practical exercises that interrupt brain trauma patterns. Then we promote new, healthy neuronal pathways that restore normal limbic system function using exercises taken from various methodologies I’ve studied over the past 20 years: cognitive behavior therapy, core belief counseling, life coaching, neuro-linguistic programming, self hypnosis, meditation, conscious restraint induced therapy, somatic exercises, and neuroplasticity exercises. and huge shifts can happen sometimes in as little as two days. JG/JL: Edward Taub’s work with stroke rehabilitation—which you are familiar with from Norman Doidge’s book—deals with motor function, so there is an objective way to assess progress as individuals become rehabilitated. How do Taub’s protocols intersect with yours and is there a way to measure objective improvement along the way? AH: The only objective way to measure progress is through the resolution of symptoms. Part of the Dynamic Neural Retraining System involves consciously blocking old pathways in the brain while stimulating dormant or new pathways. I call it Conscious Restraint Induced Therapy. In order for this to be successful you must be able to focus and practice a lot. In fact, complete focus and practice are the keys to success in this training. The time it takes for symptoms to shift is individual, and huge shifts can happen sometimes in as little as two days. For others it takes longer. I recommend practicing every day for 6 months before you judge whether or not this has worked for you, although most people see great results fairly soon into their practice. JG/JL: Going back to Taub, his work based on his “learned non-use” theory encourages the use of the non-functioning appendages by restricting use of the working hand or arm, etc. Taub has found that this forces the brain to build new neuronal pathways and eventually restores use of the incapacitated limb. How does this correlate with your work since we are talking about an illness with a different presentation than stroke, one that more likely involves damage to the limbic system vs. the motor system? Can you give us an example to help us make the conceptual leap? AH: With MCS, we develop a conditioned abnormal fear response to chemicals due to impaired limbic system function resulting from the repetitive brain trauma pattern. Fear stimulates the amygdala, triggering the fight or flight response. In order to change our physiological response, we have to learn how to interrupt the trauma pattern and redirect the impulses that trigger this automatic fight or flight response. In doing so we are consequently reprogramming our limbic system to reduce the physiological symptoms of illness. JG/JL: This sounds very similar to Ashok Gupta’s Amygdala Retraining Programme™. Are you familiar with it? AH: No, I am not familiar with it so I cannot say if it is or not. From what I’ve viewed on the Internet it seems that he is focused solely on the amygdala portion of the limbic system. Although the amygdala is involved, with chemical sensitivity, other parts of the limbic system are also involved including the hypothalamus, hippocampus and cingulate cortex. JG/JL: Does your work fly in the face of the “body burden” or “rain barrel” theories out there regarding MCS? That is to say, do you think the toxic overload theory is faulty as a basis for treating full-blown MCS? AH: I think that toxic overload is a resulting symptom of impaired limbic system function, not the cause. JG/JL: Where does the blood/brain barrier fit into all of this – can you rewire or repair it with this work? AH: Yes. When limbic system function is repaired, your sense of smell will change as well and you will not be able to sense chemicals through your sense of smell or taste anymore. Now I can pick up a bottle of perfume and smell it and it smells the same as it did prior to becoming ill with MCS. Not that I would ever use it again – it’s just great to be able to function normally in a world that uses chemicals and electricity. JG/JL: That’s hard for us to imagine. It is very uplifting to hear that you have healed yourself from this devastating illness. Have others with MCS been healed by your program and did they have severe life-altering MCS as well? AH: Yes, the DNR System has helped to heal others who had severe life-altering MCS as well – even those who have had MCS for over 30 years. 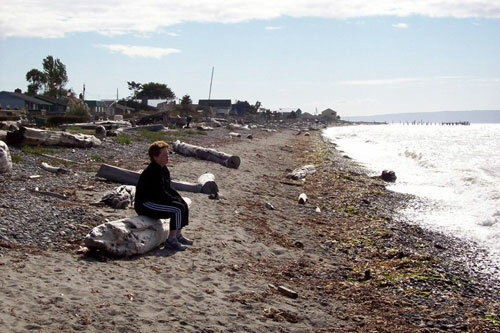 Annie spent a lot of time in isolation, taking walks with her dog and sitting by the water’s edge. JG/JL: Will your program benefit those with the often overlapping conditions of fibromyalgia, chronic fatigue or myalgic encephalomyelitis? AH: Yes, because they are all limbic system related. JG/JL: Are there certain individuals with chemical sensitivity that might be better candidates for your program than others? For example, those with neurological symptoms vs. gut or respiratory symptoms? AH: I believe that anyone who has the ability to focus and discipline themselves to practice daily would benefit. JG/JL: Are there some people/conditions you think would not be helped at all by your program? AH: Yes. It takes a certain amount of conscious awareness to be able to focus, monitor and control your thoughts, feelings and behavior for it to really work effectively. I also don’t think it would be great for anyone who does not believe that complete healing is possible or if they are closed to new ideas and ways of thinking. Remember that they once thought that the earth was flat. JG/JL: True, but if it takes a certain amount of conscious awareness, then will this program work for problems that affect consciousness? In other words, if the person is reactive or symptomatic at the time of the workshop or the therapy – and having difficulty processing thoughts and emotions – will the exercises still be effective? AH: My goal is to create a safe, healthy and productive environment for all course participants. Workshop venues are selected for hardwood floors, tall ceilings, healthy air flow and absence of use of any chemically based cleaning products. Class sizes are kept to a maximum of ten participants, allowing for lots of individual attention. Should a participant have any particular special requirement or concern, I will do my very best to accommodate their needs. That said, I give enough handouts and instructions for participants to be able to practice on their own after a workshop if they are unable to remember or retain what was covered. to change the body’s physiology. JG/JL: When you claim that your Dynamic Neural Retraining System will heal those with chemical sensitivity, chronic fatigue syndrome, and other related ailments, you are most likely talking about complex disease systems that involve multiple toxic exposures, not just one specific chemical brain injury. Some with MCS have had toxic mold exposure and have genetic susceptibility to biotoxin illness while also having a lyme infection with complicating co-infections, as well as pesticide poisoning, chronic viruses, mycoplasma, leaky gut, and organ damage. How can the brain reconditioning exercises heal all that? AH: Through changing the brain we have the ability to change the body’s physiology. JG/JL: Can you elaborate on that – once the brain is rewired, what happens with these infections – lyme, viruses, mycoplasma, etc. – does the body take care of them more easily or must one still go through the arduous process of using a combination of antibiotics, herbs, supplements and dietary changes to manage these parts? AH: Of course each case is individual, but as I said in the above, the brain has the ability to change the body’s physiology. JG/JL: That still seems a bit vague. Are you saying that it’s a sort of domino effect, so when the brain is reconditioned, the body will heal itself of secondary health conditions that arose from the primary brain injury? AH: Yes. Very well said! Your brain will no longer send alert signals that activate survival mechanism messages to the rest of your body. Most participants with MCS who do the Dynamic Neural Retraining System report that they can be around chemicals now and that they do not notice the “bitter or caustic” quality of products anymore. They do not need to take as many nutritional supplements or any at all. Others have reported being able to eat foods that they have not been able to eat for years while some others report the ability to sleep well for the first time in ages. One participant had a severe skin condition in addition to MCS and has noticed that her skin has cleared up remarkably well. The results of the Dynamic Neural Retraining System speak directly to the domino effect that you are referring to. JG/JL: Some in the MCS community are very much against using the word “cure” for any treatment promising full recovery. Many of these people will say that anyone who has been “cured” is actually just higher functioning but still has MCS and must avoid chemical exposure as much as possible to maintain their functionality. You chose to use the domain name “MCScure.com” for your website introducing this work, which might seem like a promise you can’t keep to many in the community. Can you define what you mean by “cure”? AH: I would say that by “cured” I mean that you can resume a normal lifestyle and be over 85% recovered from symptoms. Although I do not react to chemicals anymore, I do not choose to use them in my life. I avoid using them but I do not avoid exposure. I know that it’s hard to wrap your brain around the idea that this debilitating illness can be cured and that you can resume a normal life again. I get it. It’s almost unbelievable. But this treatment protocol is completely different from anything else; it is based on repairing the brain, not the body. In some ways having MCS lifted a veil for me and I instantly became aware of the harmful effects of chemicals and how prevalent they are in our society. As a result, I now choose to live my life in an environmentally conscious way. JG/JL: Are YOU cured – or is your lifestyle still limited or altered in any way in order to maintain your current level of functionality? AH: I am cured. I travel to places, I fly on planes, I attend live theatre, I go out for dinner with friends, I attend public events with ease, I work, etc. Annie dancing at a crowded night club, post-MCS. JG/JL: Once you determined how to rewire your own brain, how long did it take you to regain your ability to function in the “real world”? AH: Less than a week. JG/JL: That’s so incredible, it’s hard to believe! Did you have any relapses during this initial experimental phase? AH: Yes, at day 15 I experienced a complete shift back to full-on symptoms of MCS. If I ever needed proof that it was brain related – that experience did it for me. It was like a switch went off in my brain. I focused on my brain training exercises and the switch went off again. JG/JL: Is your recovery permanent—or do you need to do daily exercises in order to maintain the level of recovery you have achieved? AH: Yes, my recovery is permanent. I do not practice regularly anymore. I practiced daily for about the first 6 months. JG/JL: How stable is your recovery now—do you ever have periods of increased reactivity where you have to repeat a course of the exercises? AH: My recovery is stable and I do not have periods of increased reactivity. However I will use the brain training exercises if I am feeling anxious about anything. Most participants with MCS … report that they can be around chemicals … they do not need to take as many nutritional supplements … others have reported being able to eat foods that they have not been able to eat for years while some others report the ability to sleep well for the first time in ages. JG/JL: How long have you been giving the Dynamic Neural Retraining System Workshops? AH: I’ve been leading these workshops for almost a year now—since November 2008. JG/JL: What kind of accommodations do you make in order for those with chemical sensitivity to attend your seminars? As you well know firsthand, one of the main problems with MCS is functioning in any public setting because of triggers that may be present and there is no universality to what those triggers can be. AH: I make it very clear to all participants that the workshops are scent-free. I just finished teaching a workshop in Victoria strictly for people with MCS. Because they all had the same condition, they know the drill. The space was an older building with hardwood floors with 40 foot ceilings and lots of air flow. The air quality worked well for everyone there. JG/JL: You mentioned that your seminars are 3 days long and 6 hours each day. Can you describe what kind of sustained activity an individual would have to be capable of to fully participate in the seminar sessions? AH: First of all, there are many breaks during the day. Activity involves sitting, occasionally standing, and simply concentrating on the course instructions. There have been people who brought in their own cushions and lawn chairs so they could lie down because they are unable to sit for that long a period. Many with fatigue and concentration issues have reported how surprised they were to be able to attend the workshop for 3 days. JG/JL: You have said that one must attend one of your workshops to do the work and that home study is just not realistic due to the sustained training needed for this work. We have friends who would seem to benefit greatly from this work but they are homebound due to severe sun sensitivity and/or other sensitivities and they could never attend one of your workshops. Many others with MCS could never travel to Canada or could never afford a workshop because they are living below poverty level. Are there any alternatives to doing your program for those who are unable to physically attend an actual seminar? AH: You need a very disciplined regulatory system in place to prevent reinforcing the trauma-patterned networks in your brain. I provide a high degree of discipline, instruction and structure to encourage you to stay on track all the time. That’s why I believe that having an instructor present during the training is more effective. However, I realize that this option is not possible for some, so in time I will have a DVD version of the training that will be as highly interactive as possible. I go out for dinner with friends, I attend public events with ease. JG/JL: We are looking forward to viewing the DVD. Could a person who has attended one of your seminars in person teach the therapy to another person who is unable to attend because of severe limitations if they were able to mirror the training using the parameters you have instituted for in-person seminars? AH: In time there will be a Dynamic Neural Retraining Practitioner Program. JG/JL: What health conditions have the people who have attended your workshop had? AH: There have been participants with chemical and electrical sensitivities, chronic fatigue syndrome, obsessive compulsive disorder, depression, fibromyalgia, chronic pain syndromes, and anxiety issues. JG/JL: What percentage were successful with the treatment via your workshops? AH: Approximately 80% of participants to date have experienced significant changes in their health. Most are still in their six month training period and are completely recovered while others continue to experience steady improvements. Please see the website at retrainingthebrain.com for workshop results and testimonials. JG/JL: That’s a very high success rate – we hope you are able to get funding to backup those rates with scientific studies. Currently, your workshops are only offered In British Columbia. Do you ever travel to other areas to share this work? If not, are you open to it – what are the prerequisites, and how should people contact you to arrange a workshop in their area? AH: Yes, I am open to traveling to other places but require a minimum of 10 participants per workshop. I am offering a workshop in San Francisco November 14-16, 2009. Those interested in bringing this workshop to their hometown should e-mail me at info@retrainingthebrain.com to make arrangements. JG/JL: How can Planet Thrive members find out the particulars of participating in a seminar and find a current schedule and prices? AH: Go to the website at retrainingthebrain.com. The price of the workshop is $895 US per participant for a 10-person workshop. JG/JL: Although you will be offering a DVD and book in the future for those unable to come to a workshop, is it still preferable to learn this work in person? AH: As I explained earlier, it’s preferable to learn this work in person, however I know the restrictions that most people have with MCS and I am making the DVD for that reason. JG/JL: Ideally, how often must one do the exercises in order to optimize results? AH: Approximately one hour a day for 6 months. It does not have to be all in one sitting, you can break up the hour into 10 minute segments. JG/JL: Are there different exercises depending on the illness – or is the program a one-size-fits-all, offering the same approach whether you have chemical sensitivities, chronic fatigue syndrome, or electrical sensitivities? AH: All of the above illnesses are related to impaired limbic system function so therefore the program would be the same. JG/JL: If, due to illness, one could not complete the program as detailed but instead did the exercises as often as they could, possibly every few months or even over several years, would that still be effective? AH: No, I don’t think it would be as effective – repetition and concentrated practice are keys to success. JG/JL: What is your vision with how this work can help others? AH: I believe that this work will give people back their lives. My vision is to facilitate healing while promoting environmental awareness. The way I see it – the more people that heal from this illness, the stronger our unified voice is to make some much needed changes on a global level. Because remember, while the Dynamic Neural Retraining System repairs limbic sytem function, it doesn’t prevent illness. In order to protect our health, the planet and prevent MCS and related conditions from occurring, we need to mandate our governments to make changes in the way we live and treat the planet. JG/JL: We definitely agree with that statement. How has getting severe chemical and electrical sensitivities – and then recovering from them – changed your life? AH: Recovering gave me back my life. I am more grateful now for all of the things that I used to take for granted prior to getting sick with chemical sensitivities, fibromyalgia and EMF sensitivities. I have more appreciation for what some people say are the ”simple things” like going shopping, out for dinner with friends, the ability to travel and visit my mom, the ability to work, etc. Every day I am grateful for my health and my ability to help others. I have a much deeper relationship with my body, the environment, the planet and Spirit. I am completely obsessed with work and trying to make this program available to all the people who so desperately need it. I feel a lot of pressure at times because I know the suffering involved in this illness and how great the need for healing is. JG/JL: You were a core belief counselor prior to becoming disabled by severe chemical and electrical sensitivity. Now that you are essentially recovered, how has your experience with neural reconditioning affected your professional practice, if at all – were you able to incorporate any of these concepts into your approach? AH: Yes, in some ways it has affected the way that I work with my clients and yet, in some cases it has not. I have decreased my practice substantially to focus on workshops, creating the DVD and writing my book. JG/JL: Are you available for phone sessions as a core belief counselor for others with MCS? Do you offer one-on-one sessions for the neural reconditioning? AH: No, I am not available for either of those services. I’m too busy teaching workshops, creating a DVD and writing. JG/JL: Is there anything else you’d like to share with us today? AH: Don’t give up – there is a cure. You can totally recover from MCS. JG/JL: Congratulations on your own healing and thanks so much for your promising research and making it available to others. If this program indeed delivers the high success rates you are claiming, the potential to transform people’s lives is huge. We encourage you to pursue funding for scientific studies that would allow you to reach a wider audience. Best of luck, and let us know when your DVD is available. Find out more about Annie and her brain retraining program by visiting her website at retrainingthebrain.com. For those who have already attended Annie’s workshop and are looking for additional support, please join our DNR Support Group. For updates on Annie’s Dynamic Neural Retraining System and forthcoming book and DVD program, stay tuned to Planet Thrive. Those interested in attending her November 14-16, 2009 workshop in San Francisco should contact Annie as soon as possible, as space is limited. Note: This information has not been evaluated by the FDA. It is for general information only, and is not meant to diagnose, prevent, treat or cure any illness, condition, or disease. Neither Planet Thrive nor the interviewers are suggesting this is a cure for the illnesses mentioned above, as we have no direct knowledge of the exercises involved and have not spoken to any workshop participants; we are merely presenting Annie Hopper’s claims for the reader to explore further. We recommend reading The Brain That Changes Itself by Norman Doidge, MD (required reading for all workshop participants!) if you are interested in learning more about brain plasticity, an area of research we believe holds great promise for those with toxic brain injuries. Annie Hopper photos: © James Tozer, reprinted with permission. Julie Genser and Julie Laffin are friends who have joined forces in their research to find people who have improved their functionality after suffering from severe chemical sensitivity. 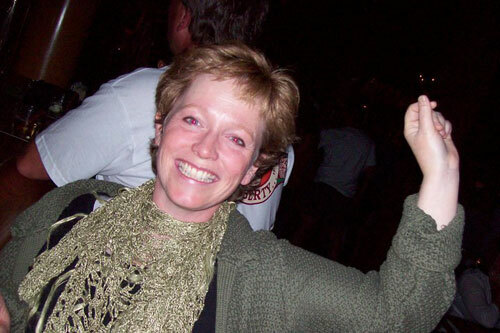 Julie Genser runs the websites PlanetThrive.com and limbicretraining.com. Julie Laffin is a Chicago-based performance artist currently working on transforming her work to embrace and transcend her health challenges. A big thank you to Steve Savitz for alerting us to AnnieHopper.com, which started us in our research on brain plasticity. I think this type of therapy is hard to wrap one’s brain around unless you know the exact exercises involved, which we don’t in this case. I am doing the Ashok Gupta Amygdala Retraining™ exercises though which I believe are very similar. I have experienced shifts in my unconscious stress response. Major shifts occurred in the first 2 days. But have these translated into an MCS cure? Not yet! It’s too soon to tell what, if any, physical improvements have occurred. But I do believe it is helping. I have not been 100% focused on these exercises either. What a fascinating interview. Thanks for getting it. I recently saw an interview with Norman Doidge and will be reading his book shortly as well as another book along the same lines. Best of luck with the Ashok Gupta Amygdala Retaining exercises. : With MCS, we develop a conditioned abnormal fear response to chemicals due to impaired limbic system function resulting from the repetitive brain trauma pattern. Fear stimulates the amygdala, triggering the fight or flight response. In order to change our physiological response, we have to learn how to interrupt the trauma pattern and redirect the impulses that trigger this automatic fight or flight response. In doing so we are consequently reprogramming our limbic system to reduce the physiological symptoms of illness. For me that is big issue. But is this suggestibg MCS is a psychological sdtress cayisng physical symtps or? Thanks Betty! Let me know how you like the Doidge book. Glad you liked the interview. No, it’s not saying MCS is psychological. The opposite – it is physiological. There is a problem in the amygdala and other brain areas which have been damaged in certain ways by chemicals, mold, and other agents. However, if I understand it right, the theory is that our body is in a state of extreme reactivity due to this physical damage to our brain. If we can rewire and calm that overreaction, we can normalize body functions. I’m having a bad brain day myself so hard for me to explain. I found that reading the Doidge book I mentioned above really helped open my mind to what could be possible. Sorry I can’t explain it better. But I really recommend you get the Gupta DVD. It’s $190 I believe. Much cheaper than Annie’s workshop. Then you can do the exercises at home every day with guidance. I don’t usually tell people so forthrightly to spend their money like that. But I know you are in a bad way right now and I think this would be helpful to you if you could embrace it. I will be posting an interview with Gupta soon too so you could wait to read it…to get a better sense of it. I’m not saying it’s a cure, but I think a helpful tool to get control of the anxiety and overworrying that I know you struggle with. It works on a physical level even though the exercises may SEEM more of a psychological fix. It’s not! It’s physical. It’s about rewiring neuronal circuits. But we can do this by altering our thoughts. Complex stuff to think about. Thanks for the interview. I’m convinced the brain is a huge issue for those of us with mcs and related illnesses. I love hearing about this because it gives me hope. I live in an area where there are several of us who have done so much in an attempt to get well. For me I’m convinced my hyper anxiety responses increase reactions. Anyhow….I believe a brain shift COULD cause a cure to occur. Thanks Lauryn! I do think MCS is an acquired toxic brain injury. Whether Annie’s training workshop is an MCS cure or not is another thing. At this time, all I can see is that she is the only one saying it’s a cure. I have not heard from any workshop participants agreeing with her. Even the testimonials on her site are all about improvement, but no CUREs. So I think her claims might be exaggerated. Nonetheless, I do believe brain plasticity is a very exciting research direction for MCS and I plan to continue exploring the area and presenting what I learn. I would take her workshop if it were accessible and affordable but right now it’s not. I have experienced gains with Ashok Gupta’s brain retraining exercises and I believe every little bit of help doing these exercises would be worth it! Thanks, Earthwalker. You are doing a great service. I will look into the Ashok Gupta brain retraining exercises. I’ve been listening to Holosync cds for the last couple years which use binaural beat technology to lower brain wave frequencies and help balance the brain. My emotional and mental reactivity has decreased gradually but significantly. My ‘physical’ reactivity is down also, due to many protocols over the years but also most certainly in part this ‘brain wave entrainment’. I have become convinced, not only because of my own experience, but because of the certain similarities in all the chemically sensitive people I’ve met, that there is a brain/trauma connection. Trauma, physical or emotional is proven to change the ‘shape’ of the physical organ, the brain…..
Annie may not be reading these comments on her article. If you want to ask her a question about it, please contact her through her website http://www.mcscure.com. I am also doing the Gupta program and I would encourage you to keep at it and be diligent. I had some deeply ingrained negative thought patterns and I am working on them. They are harder to get at and take more work, repetition, and focus. Not sure how long you have been doing the Gupta exercises or how often you do them. Thanks very much for bringing this information forward (and the Gupta program). Your questions were right-on (after I read a response from Annie you followed up with the same questions that formed in my mind), and her responses were very credible. I’ve had MCS since 1996 and lyme prob since about then too. I have definitely noticed the acquired fear response to fragrance/chemical smells. It is hard to control, but, if I can “stay cooler”/forgiving, it seems the reaction (pain) is not quite as severe. So I think there is something to DNR. I’m a physician asst with mcs pts…. will consider organizing a DNR training in my town. Thanks again for your service of offering this information. I believe Annie is just out to make money and don’t believe she was ever very chemically reactive to begin with. Most likely found this to be a niche market and concocted this whole thing years ago. I mean if this was a cure there would be lots of people from her workshops coming forward with their stories. It’s so sad when people try taking advantage of the desperate. Shame on this lady and she shouldn’t get any positive publicity from this website or anywhere else. In fact people should put the word out that she’s a fake and can’t be trusted. Actually, this lady should be challenged. Why not have her work with a few well known chemically injured people from this site in a private workshop and see what happens? Gee, I wonder why she (Annie) never thought of that??? She probably did but knew it would be the demise of her new lucrative business. I’m sorry but people like this really burn my a$$!! Well, we are all allowed our opinions and I thank you for sharing yours. It’s important to know what people are thinking. You said you “believe” Annie is just out to make money and was never chemically sensitive. You can maintain that belief but I personally will not throw out a possible tool in my MCS arsenal based on someone’s “belief”…I need facts. Annie has only been doing workshops for less than a year now. That is a very short time. MCS is a very complicated illness and all cases are unique. The training requires daily effort and I can imagine many participants did not keep up with the exercises. I will personally withhold judgement on the therapy until Annie has published scientific studies to back up her claims and published her DVD so I can see firsthand what the training involves. Even if her training turns out to be bogus and she is revealed as a fraud (which I do not believe she is), I still think it is important to put this therapy approach out there. You just never know who will read it, or what it will lead to. Can you tell me why you believe she made up her chemical sensitivity? I know of two people who were friends with her before she was “cured.” I also know she lived in a special MCS-safe home. Can you back up your statement with facts? That would be helpful. I agree that it would be a great PR tool to do a private workshop for several severe MCSers who have been publicly known in the community for years. I wanted to bring her to the community I live in which has ~20 long-term MCSers. But we cannot afford it. There are some people who have been homebound for years and are in very bad condition, my boyfriend being one of them. That sure would prove a “miracle cure”! Annie, if you’re reading this, come to Snowflake!! In the meantime, the only way I can “challenge” Annie is verbally, and I have already followed up to the interview with some hard, tough questions. Stay tuned for the follow up Q & A…. I hope, for all of our sakes, that she is the real deal. Wouldn’t it be wonderful if Annie was able to provide a cure for the growing numbers of MCS sufferers? My own cure lies in avoidance of the harmful chemicals that trigger various physiological ailments. In the home, this becomes easy and very inexpensive, once you know how. Away from home, I appreciate the consideration of others, who see my eyes become inflamed and turn red within minutes, if perfumes or paint fumes are in the atmosphere? Will her training really ease and cure very sore eyes and prevent further damage? What would she say to the reaction of a couple of non MCS people who recently holidayed with friends in Denmark? The bedding was perfumed, possibly fabric conditioners. They were unable to sleep and had to keep getting up to open the windows. Should the brain be trained to ignore warning messages regarding toxic and therefore potentially harmful conditions in the environment? Yes, it’s good that she’s drawing attention to the condition and it’s good that she’s encouraging care of the body. Nevertheless, I’ll be amazed if the power of the mind can overcome the power of chemicals. But…who’s to deny the realms of miracles! Hi Joyce, Thanks for your comments. You make a very good point with the example of the non-MCS couple on hoilday in Denmark. I don’t believe that the brain training would take that away. It would just calm an over active amygdala so you don’t get the terrible physical symptoms that accompany exposure to toxics. Annie is pretty clear that she believes people should avoid chemicals whether they have MCS or not. The training is not mind over matter. It’s returning our functioning to pre-MCS. If you don’t want that and prefer to keep the warning signs you get with MCS, then certainly you don’t have to do the training. But for those of us who want a choice whether we can leave our house or not, it would certainly be a new lease on life. I don’t think I would live very much different if I was improved. But at least I could live more comfortably (wear warm clothing, sleep in a bed with blankets, eat whatever I want) and not fight for my survival every single day. I have recovered from MCS. I have recovered completely, and in a very short period of time. I had the illness for five years and it was very severe. I was forced to live in the garden of my parents house and was unable to tolerate public places. Although I did not recover using the excercises mentioned in this article, I believe the explanation of the causes of MCS given here are 100% correct. Although people can have syptoms in any part of the body, MCS is controlled by the brain. The body becomes conditioned or ‘programmed’ to react a certain way when a person comes into contact with a chemical, and this reaction can become worse and spread to other substances over time. Analyse your state of mind when you are well, and when youve just had a reaction. When ill, your whole mind set is completely different, and youll probably have a very characteristic feeling of depression or anxiety. Over time youll come to see the difference very clearly, and it will become clear that it is triggers in the brain that are causing your symptoms. The way I recovered from MCS was by taking anti-psychotic medication. This does not mean MCS is not ‘real’ and its in peoples heads, its not. It is a real phenomenon. This type of medication affects the part of the brain that controls the bodies reaction to a chemical. I realise it is a huge leap of faith to accept this kind of treatment, it is a world away from the total load theory of environmental medicine. But it works, 100%. Its free, easy and quick. You will have your full life back in less than 3 months. When I had MCS i tried everything! absolutely everything, and after years of taking supplements, lowering my total load and living in isolation I was no better at all. This medication worked instantly. And now, after reading this article I can finally begin to explain to people why it works. After I recovered I searched the internet for any instances of other people with MCS recovering in the same way, and I found loads. But you’ll rarely come across them in enviromental medicine focused websites. Thanks for posting your experience Ben Jones. Of course most people will take your testimony to mean that MCS is psychogenic. But I believe what you are saying, about the drug working on the brain in some physiological manner that resets the amygdala and whatever parts of the brain that are involved in the MCS reaction. Can you share which drug it was you used? I will also say to be careful telling people that it will work for them, too. With a powerful anti-psychotic drug, the risks are much higher for an MCS person than doing a brain retraining exercise. Our livers are compromised and it could really screw someone up physically. We don’t know if it would work the same on everyone since every case is individual. Knowing the name of the drug would be helpful so we can research the mechanisms behind the drug action. I’d sure like to see the links to these references, can you provide them please? So what else is hindering the immune system from doing it’s job? If anyone every listened or read about the Marshall Protocol, Trevor Marshall claims it’s a cell wall deficient bacteria (CWDB) that is responsible and the root cause of inflammation and allowing other microbes to enter and thrive in the system. I know many of those people on the MP claim viral infections just start to dissipate as they continue on with the treatment that targets the CWDB. Someone needs to start testing some of these things. I’m doing the MP now and have been on it for about 6 months. I’m better in several ways and my reactivity to mold toxins and chemicals is somewhat better but I can honestly say I’m nowhere near normal and still live a poor existence because of my reactions. Who from this group is going to start on the antipsychotics??? Lori? LOL. There are many techniques that work on the principle of restructuring mind. The one problem I have with some of the techniques is the motivation behind presenting them. When I see people who are more motivated by monetary reason’s, I tend to steer clear. This could be sold on DVD for a relatively inexpensive fee for a potentially empowering means of help. I truly wish that those who can help, don’t hold health hostage for high priced workshops. Much of the self help community is largely motivated by money and this should not be the case. The founder of EFT is a shining example of not holding health hostage to the highest bidder. He has made his material highly available for free and if you want videos he has made them very inexpensive. His motivation is one of unconditional love, a concept that more “healers” need to understand. Money is not the end all and be all of existence. There are deeper values that must be considered, especially where helping suffering individuals is concerned. Julie if we have some questions for follow up interviews, can we pass them along? I am curious why the high fee being hoisted for suffering individuals? Does she believe this can help all kinds of illnesses? Would she be interested in some case studies from Planet Thrive? How is her approach different from the other ones that are being offered in the healing community? Would she describe her health as perfect now that she has utilized her method? I have a few suggestions for . I think a wider vision may serve you and the people who need your protocol. Create a website where your protocol is available both in video, audio and print for. Create a community where information and feedback is freely shared. You could have a membership fee to cover costs and have a small profit. Please understand though that this profit will stack up with lots of members. You can reach way more people world wide over the internet in such a set up and actually make way more money while giving this to the people who need it most. Win-Win! Alos if you want to have workshops for deeper understanding then that is okay as an over and above experience for those that require it. If you would like to brainstorm how this can be achieved, I would enjoy sharing some ideas. I guarantee if you take this kind of approach you will gain deeper respect, have a much larger reach, (ironically make more money), and get excellent feedback which will increase the effects. There are some powerful spiritual aspects to this approach too, such as creating powerful attractor programs and coherent and powerful morphogenic fields. Please consider what I am sharing with you. You are in the infancy of this and how you go forth will either maximize the effect or minimize it. Are you now dependent on the drugs? Or did they truly reset the condition and you are free from drugs? What can be achieved with drugs can be achieved with NLP, Hypnosis, EFT, TAT,etc. Drugs are toxic and can have other effects that can crop up later. By masking situations with drugs, it can cause a leak to spring elsewhere. It doesn’t address the root cause. Glenn, hahaha I won’t be the guinea pig for the antipsychotics thank you very much. ;-) My poor liver couldn’t take it I’m afraid. Doven, thanks for asking the questions of Ben. I had assumed he went off them after his sensitivities were eradicated. But I reread his post and see that it is not clear at all whether he is still on them. Doven, Regarding your questions to Annie Hopper, if you want to be sure she sees your suggestions, write to her through her website. I don’t know if she is reading these comments or not. I am curious why the high fee being hoisted for suffering individuals? I asked this in my follow up. Does she believe this can help all kinds of illnesses? From her site and the interview – it will help those illnesses that involve toxic brain injury to the same areas of the brain. Would she be interested in some case studies from Planet Thrive? I believe I already asked for this or something similar. I don’t think she is prepared to do it. She is very busy just doing the workshops, writing her book, and trying to organize the DVD. How is her approach different from the other ones that are being offered in the healing community? I asked a variation of this in my follow up. Would she describe her health as perfect now that she has utilized her method? I doubt it. I don’t want to speak for her, but my understanding is she believes the training will rewire the brain around the toxic brain injury. That does not mean you will be in perfect health. Health depends on other factors besides the brain, like diet, exercise, environment, relatioships, etc. Your posts are directly in line with my thoughts. And I’m thinking out loud but it’s been how long since that interview on here and how long since so many other questions and challenges have been posted on here?? Still no response from Annie…go figure. Sounds like she wants to hurry up and get a few million in the bank before everyone finds out the truth hahaha. I think we need to giver her the benefit of the doubt. I am merely suggesting she doesn’t hold health hostage as a means to profit, especially when there is a much better structure that sees her benefit as well as everyone else in a truly win-win fashion. What she is bringing is not a new paradigm. It is, however, good information that needs to find it’s target. I have a problem hearing of one treatment approach for those who were chemically injured, especially those sustaining organ system damage beyond the brain. I’m talking lung nodules, brain plaques, neurological pain and demylination and much more. Many of us have been sick for 10+ years and staying away from chemicals is the big stabilizer, as is safe housing, rest, exercise and diet. If one has no food intolerances yet, thay are not severe mcs-the reactions seem severe, but the severe health is when organ systems are damaged & nutrition is very compromised, affecting body function. I was always sensitive to petro/exhaust (even as a stewardess 40 yrs ago), but 10 years in a mold infested home, sealed twice for energy savings, which eliminated proper air exchange/ventilation, damages the body in all systems, not just the brain. I believe healing is a multi-approach for those with clear cell damage and neurological damage/impairment. It is a chronic illness for many of us. My genomic profille well explains why my genetics set up myself and Mothers/sister’s illnesses. For Mom it was pesticides and mold in both FLA & MN. And I get frustrated when good-meaning people don’t realize all the ways one gets ill from chemicals/molds and that our personal genetics, life-time exposures, nutrition status, job/home, infections exposures and injuries all play a role. We are all extremely different and benefit from different treatments. I am impaired to detox polycyclic aeromatic hydrocarbons, estrogen, certain drugs, and neurotransmitters as well as glutathione and most of the people I know, WITHOUT those impairments DO get better in time following all treatment protocols. For me, Hydrocarbons are all that we breathe and are everywhere, from building products outgassing to daily smoke, car exhaust, heat sources, gasoline, pesticides tar etc. So, what is good for one is not good for all. We can try these new exercises and drugs but we must lower our expectations; especially when an environmental physician has done a thorough review, treatment with testing & diagnosis. Sometimes diet, avoidance, glutathione, oxygen, clean air, body/energy work & exercise are all we have for a CURE!! Was there a tacit message aimed at me in your last post? How funny. I’m sorry but I have absolutely no respect for people that I believe are taking advantage of the desperate for monetary gain. If that comes back a cure and I’m wrong I’ll bend over backward to make things right for my posts, etc. But at this point I’d be willing to bet my life that I’m right. It’s also a little disturbing when there is a blockade to help the truly needy because someone’s personal feelings get in the way. Maybe we all have something to think about eh? No my post was not directed at you, per se. I have been slammed with naysayers putting down Annie and her treatment since the article was published – not just here by you but on other group lists. It is refreshing to read Holly’s post because she speaks her mind without slamming Annie’s personality. Or slamming the treatment because she doesn’t like Annie’s presentation. Her opinion seems based on what she knows rather than what she believes. I believe in giving people a chance. I think it’s real easy to take pot shots at people who put themselves out there. People don’t seem to have a problem spending thousands on doctors who do nothing for them. This is an alternative treatment and in my opinion its way too early to make judgements. I’d much rather see the treatment be experimented with and fail than be suppressed before we know how much help it can be. Then at least we can put it to bed if it does nothing without wondering what could have been. Why not support Annie as a community, but request certain things, like lowering the workshop price, providing scholarship positions for the most needy, etc.? If the program works then she certainly deserves the money she’s charging. And then maybe some kind of discount for people that just can’t afford it, which would be many due to this horrible illness. But otherwise if she became wealthy for such a significant finding, she’d have my blessings. My problem is 1) Why wouldn’t she have started in a place like Snowflake or another well known MCS community and 2) If it all doesn’t pan out (which I bet it won’t) then what? She got off with thousands, maybe millions off people who were desperate in need of their funds. I agree about people spending their life savings going around the world to come up empty on so called “experts” but this is just as bad or worse. Other than that you just mentioned believing in giving people a chance. I just made you a very generous offer to possibly help me, you and the people of this (PT) community on a regular basis and you flat turned me down with no logical reasoning. Only thing I can think of is your personal feelings got in the way because of my previous posts? If you were starving how would you feel if someone wanted to give you food but couldn’t because someone else’s personal feelings got in the way?? hmmm. I’m confused – are you referring to your offer to give me expired herbs to give away to members or your offer to place an ad on my site for your closeout – savings website? You didn’t mention any dollar amount so I really don’t know if it was a generous offer or not. As I explained to you, I’m not interested in giving away expired herbs, as I don’t want to take on additional liability. And I also said that I am not in a place to make decisions about an ad right now. There is one ad spot. I have companies in mind to target that are much more aligned with my website’s membership, but I am not well enough to focus on this right now. I reserve the right to decide who advertises on my site, and when. Sorry if that doesn’t seem logical to you. What sort of “food” are you offering to feed starving MCSers Glenn – your products from your savings warehouse? Isn’t it a bit ridiculous to compare selling health products to make a profit with feeding starving people? I really don’t appreciate your implying I don’t have the best interests of my membership at heart if I don’t let you advertise your wares on my site. The expired herbs are selling now in lots for $89 each and I offered to give them to PT for free. Is this not generous?? I was asking nothing in return. I’m sure there are many here that would’ve really appreciated this. As for the other products, one was non toxic cookware and the other was a very specialized form of lipoic acid that has helped thousands (not a cure though) with MCS, Lyme, CFS etc, myself included. I offered to list it on here or link to my site at a highly discounted rate. Not necessarily to my closeout site but my other site that I mentioned. How is this not aligned with what you’re doing on here??? Right now there’s an ad for a Vitamix LOL. Seems like my offers and products are much more aligned with what is going on here. Great interview, Julie. This does inspire hope. I had a lot to say about this, particularly in response to some of the criticisms and attacks on Annie. Due to its length, I posted it as a discussion in the DNR group, so as to not hijack this interview. I hope those in this discussion will read my responses to their comments. After getting J’s blessing to post the above-mentioned response, I will copy and paste it here. Bear with me; it is long. This is a great interview, Julie. I have to say that just reading it gave me the hope and motivation to get more serious with Gupta and to read more on the subject. There really is so much information out there supporting this sort of thing, for people who are interested in actually learning rather than jumping to negative conclusions. Gupta and Hopper seem to have come to very similar conclusions from what they’ve learned through their years of research. We have the same resources available to us that they did; I’ve got a to-read list a mile long. I’ve spent some time browsing book after book on similar subjects, just reading the summaries and readers’ reviews, and that alone has been eye-opening. I’m looking forward to reading Doidge’s book. I’ve also seen documentaries and youtube videos on the subject. The info is out there. None of this is particularly new and ground-breaking information, much to my surprise (b/c it is new to me!). I’ve even come up with some of my own exercises as an addendum to the Gupta program, and they definitely help. I know someone who has applied 12-step principles to healing her MCS, along with the Gupta programme, and she has improved VERY quickly. After a while, you start to wonder why we couldn’t have come up with this ourselves! :) But thank goodness for people like Annie and Ashok who can put it together for us. It is good to see the kind of reaction I will get from the community if (WHEN) I recover and begin my mission to help others with MCS. Apparently, you are evil if you make money from your work. Interesting. Glenn… what do/did you do for work, and did you do it for free? Let’s come out of our negative thinking cycle (see: Gupta programme) and be reasonable. I have only been sick for about 5 years, with MCS for one, and my life is in financial ruins. I won’t be able to pick back up on my career even if I do heal. I’ll be starting over in my late 30s or 40s with over 6 figures in debt, nothing to my name, and no usable skills to make a living wage. Most of us have had similar financial setbacks; there is no reason to think Annie is any different. It is amazing that anyone can ever pick their lives up from MCS and make a decent living… I choose to interpret her success as an inspiration, not as yet another evil person out to get me. I, for one, will have to charge for any services that I might be able to render, for a loooong time, in order to get back on my feet. Like everyone else in ANY field of work, I’m expected to give back, and I obviously intend to when able, just as I did before I became ill. But it is obvious here that no matter what one does for the community, they will be attacked. I think it is VERY premature to be judging her. Her practice is in its infancy. Even if she had no history of illness, few businesses are in the position to be charitable from the beginning. It is amazing to me that she can do this at all, and yet people question why she didn’t do this or that, or do it in Snowflake. I’m not sure why the community thinks that the recovered people owe their lives to the rest of the community. She is supposed to leave the life she knows in Canada and move to Snowflake? I’m sure when/if she runs out of people to help up there, she will venture out to reach other areas. Actually, she offers that option. It is asked why she doesn’t put out a DVD. As stated in the interview, that is in her plans. Again, these things take time. It is asked why she does on-site seminars instead of free online help. It is claimed that she will make more money that way, without any research or figures from any sort of accountant or financial analyst to back it up. Further, and again, these things take time. The logical first step in any therapeutic program is to work with people one-on-one first. If she first made an online program and had no first-hand experience with clients one-on-one, would you not question THAT strategy? THEN we would have reason to call her a fraud. Gupta worked with patients locally for quite some time before coming up with a program that he felt was adequate for mass production. I’m sure there was a lot of tweaking of the program from its infancy to the time it was developed into a DVD, based on responses by his early clients. As a veterinarian, this criticism makes absolutely no sense to me. I certainly didn’t come straight out of school and create a website so I could share for free all that I had learned over the past 8 years. I would certainly be upset to see anyone become massively wealthy off of us without helping the less fortunate (which is most of us), but to assume that is the case with Annie is just making blind assumptions. And making millions from a $900 seminar that has very limited attendance and as of now has I think 4 sessions scheduled? You might want to check your math. More power to her. I hope her all the success; any success she has with the seminars will only translate to help for all of us. I just want to urge everyone to stay positive and supportive of the rest of the community. It is interesting to me that this is a core principle in much of the reading I’ve been doing on this subject recently. Jumping to negative conclusions and being caught on the negative thinking cycle is exactly what programs like this teach you not to do. Ironically, the naysayers appear to be the ones who could benefit from this type of therapy the most. Positive thinking is at the CORE of healing. I have definitely noticed in my years of dealing with online “support groups” that there is a certain sector of the population that is so mentally resistant to getting better. They are very skilled in the use of assumptions, denial, and avoidance. When others DO heal, they conclude that those people just must not have been all that sick to begin with. They make this assumption without the slightest attempt to even find the truth on the subject (as in Glenn’s accusation of Annie). Certainly it is true that some of you are among the sickest and most difficult to cure. But that is just not the case with the large number of people who take on this attitude. Just look around and talk to people who HAVE healed; take notice of what they have done and what traits they have in common. You will be hard-pressed to find the closed-minded among them. That is actually what I love about PT… people here are generally open-minded and healing-oriented, as opposed to the negativity, despair, and anger that you find elsewhere. People here work hard for their health; the others wait around for an easy cure. And they’ll wait for it for as long as it takes. I hope I am not sounding too preachy; I certainly do not have it all together, and yes I am still very debilitated. I know that all these negative feelings we have have happened for a reason… a biological reason based on our experiences and all the chemical, electrical, and inflammatory goings-on in our brains. So I do not completely blame you for them. I am trying to come out of the anger phase of grief, myself. But everything we read, every conversation we have, and definitely every brain retraining exercise we do, can be another experience that can lead us on the “path to wellness,” as Gupta says. I’ll reply more to this later but for now I just wanted to point out a couple of things. Number one I clearly stated in one of my above posts that if Annie’s program works I think she absolutely deserves to make money, even if she became financially wealthy, she’d have my blessings. I’m a very positive person and work with being positive and truly believe we can find a cure if we work together. Only in cases like this I think money is probably her entire interest and knows very well that her program is no cure for MCS. That’s what bothers me. If she’d promoted it differently, calling it something that needs to be explored and that can possibly help it’d be a different story. The fact that she calls it a cure and nobody has come forth with a so called cure makes me more than skeptical. ashok, hooper and lightning process are all put forward as training programmes and not treatments. this enables them to sidestep the normally protective aspect of a governing body which complimentary therapy and conventional medicine has. it is also very difficult to get any real truth out of people who believe in this kind of treatment as by its very nature (i.e. for it to be able to work) you must have 100% belief and absolutely not accept anything to the contrary, which makes critical discussions on it pointless. positive thinking in my opinion is very detrimental to physical and mental health…eh! i here you gasp :O…it puts a spin on every situation and so has no relationship with truth. understanding is neither positive or negative is just is…and effortless. i.e. positive thinking is the reaction to a negative state and so contains it. positive thinking puts a spin on every situation and so has no﻿ relationship with truth. i am aware that these techniques can have a limited affect within their boundaries but imo this is at the expense of real recovery. many times i have also heard these techniques called “alternative” therapies and grouped with complimentary therapy which for me is annoying as its nothing of the sort. i’m not sure about this particular technique but many even say that to follow a therapeutic diet or physical therapy is detrimental as this is accepting a physical illness that needs a physical cure, when in there opinion it doesn’t. there are a small number of people who recover spontaneously from these illnesses with small or no adjustments to their life. they then believe that what they were doing if anything was the reason and will work for all. as far as m.e. goes the chief medical officer in the uk stated that even mild m.e. is a devastating illness, which my view is correct, therefore improvement means very little unless you completely recover at the end of it as else its just waiting for that relapse. i’ve had m.e. 11 years, mcs 5-6 yrs and know that recovery is much trickier now than it would have been in the first few years. if i had recovered earlier on i would have thought others could do it similarly…i’d have been wrong. that said i believe i know that everyone can make a full recovery so my illness is not a self fulfilling prophecy. I would like to see more about this- and hear more testimonials. I have had MCS and other health issues for quite a long time – my MCS has improved in some ways but my body does continue to react to chemical based products. (I improved by drinking pure well water, eating organic & gluten free, and living rural & getting good exercise, and taking a few homeopathic pills + perseverance). It would be cool if parts of the seminar could be put on youtube so we could have a better understanding of what it is all about. For someone to say they are cured, and not share how except if you pay a large amount of money for seminar kinda stinks – i don’t mean to criticize either but if i was cured I would be yelling from the rooftops how it happened, play by play. :) Every little thing that has helped me improve I have shared with anyone who asked. I understand that she needs to be paid for the time and space she uses to train people for her living – but at over $800 a seminar, with 10 people in it that is $8,000 + dollars she would make each time. I just wish if there is a method out there that cured her, and it only took days – and it is that simple, then it would be rather simple to share even a few techniques we could be doing in the meantime. I do understand she has to make a living (we all do!) but i believe if we could have people succeeding at this and having chances to try it out free, she would be taken care of financially as more people healed and were thankful!!! Great interview, will be doing some reading and research on this subject. Leslie, I agree with you. Thanks Erik – will be interested to hear your thoughts as you learn more. Jason, I am not a fan of the “positive thinking” camp either. But I don’t feel Gupta’s training falls into that. This is the point I have been trying to make. I don’t think Annie Hopper’s program does either, but I haven’t taken her workshop and don’t know what her exercises entail so I can’t really comment. One thing I will point out, is most of the positive, supportive comments I’ve been hearing about Gupta’s work are by people actually doing his exercises and seeing results. All the naysayers are those who have not done his program. I have at least 5-6, if not more, MCS friends doing it and all have said that they have seen improvements. But they’ve also said that it was difficult to stay motivated and committed to the exercises; but when they do focus on them, they do better. Which is why both Gupta and Annie say you need to suspend disbelief and believe 100% that you can be cured – if you don’t there is a much higher chance you won’t follow through on the exercises, and when you do do the exercises, you won’t be fully committed to the process. It’s not about blaming the victim. It’s about giving the program your “all” so it has the best chance of working. Think about a lie detector test. If you say you’re happy but you’re actually really angry, your stress response will show on the detector. It’s the same idea – saying you believe in something but withholding on a cellular level is not going to be helpful. You really need to believe it for it to work because it is exactly the stress response that you are working with. I would suggest that people base judgements on their own direct experience, not their projections on what they think something is. I also would not compare these approaches to the Lightening Process, which I’ve heard IS more of a positive-thinking-blame-the-victim-if-it-doesn’t-work program…from my limited emails with Annie since the interview I gather it is not like the Lightening Process. She probably used parts that were helpful but completely customized her approach with other exercises. Hopefully she will answer my follow-up questions soon. The theory makes sense in a general way, meaning that it is internally consistent. It doesn’t come across as some sort of ‘just imagine things will be better, and sunshine and lollipops will dance your way and make you all healthy!’ nonsense. Nor does it go down the road of psychologists who claim that one should ‘just ignore the symptoms and they’ll go away’. Rewiring deeply ingrained brain pathways isn’t this simple. It explains some symptoms better that the ‘rain barrel’ or ‘Dr Pall’ theories do, specifically how MCS can cause massive and instantaneous reactions to chemicals. Only the nervous system is capable of reactions like this. I haven’t read up on this enough to see if there are any things it explains worse than the ‘rain barrel’ or ‘Dr Pall’ theories. In terms of acquiring MCS, the majority of patients report a precipitating incident: either a brief massive exposure to sensitizing chemicals, or a cumulative massive exposure to sensitizing chemicals over the course of several months. This would seem to be an opportune time for brain pathways to be rewired, as the body is dealing with toxic chemicals for which there is no natural analog (and the body has not evolved defenses for). This is far different than stating that ‘it’s all in your head’, as MCS doesn’t simply happen because of psychological trauma. MCS is acquired through the body being overexposed to toxic chemicals, which cause physical injury and trauma — this theory states that this is the point at which the brain becomes rewired into new (oversensitive) pathways. Overall, the theory makes sense to me and I plan to dig into this a lot further. Thanks again for sharing, Julie. I read the interview up until Annie Hopper said that she has resumed a normal life including flying on airplanes. I fully believe that MCS and any other illness can be reversed. The toxicologist who diagnosed me with MCS suggested that the hypothalamus, hypocampus and the fight or flight response goes on overdrive, perceiving everything as a threat. I can definitely wrap my mind around the neural pathways changing, leading to physiological changes in the body as well. I have done some of this work on my own with affirmations and have come very far in healing my own MCS. However, I have become a much more conscious human being since developing MCS. I do not fly, I live off the grid and all of my lifestyle choices are made responsibly. It stirs me up when I hear that someone who once had what I view as an opportunity for a wake up call revert back to the old lifestyle. Pesticides are used on airplanes. The aviation industry is a significant contributor to CO2 emissions, air pollution and the depletion of fossil fuels. They use pesticides in airplanes! We as canaries have an opportunity and a responsibility to live as warnings to the rest of the world. If I healed completely from MCS, which I believe I will, and reverted back to my old urban, wasteful, polluting lifestyle, I would feel that I had wasted the learning experience I was given with this illness. So, yes! Focus on healing. Focus and concentrate on rewiring those powerful neurons in your brains. But speak out to the rest of world. Warn them that they paths they lead are destructive. Show them alternative lifestyles that are sustainable and healthy. Make your choices count. Don’t join the masses again just because your body isn’t revolting anymore. The Earth is revolting every day and we need to respect that.